Since we haven’t been able to snag a piece of ruby chocolate yet, we decided to try another rare, but slightly easier to find, type of cacao: Porcelana. It’s a hybrid or offshoot of Criollo cacao, which is considered the highest quality cacao. Porcelana cacao is primarily grown in Venezuela, and it’s not particularly hardy, which is why it’s rare and expensive. More than once, it has been on the brink of extinction, and while it originally could be found from Venezuela to Mexico, now it seems to only be grown in commercial quantities in Venezuela. It’s called Porcelana (also the name of an old-school fade cream, which is where my mind went) because the beans are almost white, but once they are roasted and ground, the resulting chocolate looks exactly like any other chocolate. I found this a little disappointing. At least the new ruby chocolate is pink. 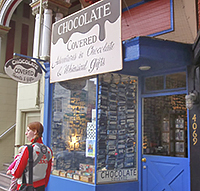 But not to be deterred, I visited Chocolate Covered, the Noe Valley chocolate mecca (they offer over 1,000 different bars at last count), and got owner Jack Epstein to help me pick out a variety of these pricey bars. I’m not kidding, these are expensive bars: Expect to pay double the price of your average artisan chocolate bar (or 10x what a Hershey’s bar costs). I got a few bars from different makers to see what range there might be to a naturally rare chocolate, and assembled a group of 5 chocolate lovers, none of whom had tried Porcelana chocolate before, for a tasting. First up was a bar from SFBA chocolate maker, L’Amourette Chocolatier, who make a lot of interesting bars at a good price. They try hard to keep prices down but quality up, and their bar was the least expensive of the 3 we tried. 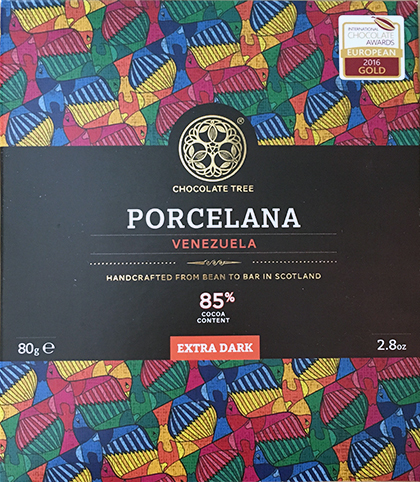 Their Porcelana Criollo Venezuela Cuvee Elite 75% is a nice bar overall, but there’s nothing to indicate that it’s special at first glance. The packaging is similar to their other bars, and the chocolate itself is made with the same mold as other L’Amourette bars. And as noted before, the chocolate is not white, but the same color as any other 75% dark chocolate bar. The flavor was interesting: It was not fruity, like I expect Venezuelan chocolate to taste. Instead it was nutty — and a little bitter. This was a polarizing chocolate for our little group: 4 of us liked it, but for the one who didn’t, it was a big NO. She thought it was extremely bitter and too hard. At $16, it’s twice the price of their other bars, so I know that Porcelana must be an expensive bean if L’Amourette can’t sell it for less. The 2nd bar we tried comes from Canada. 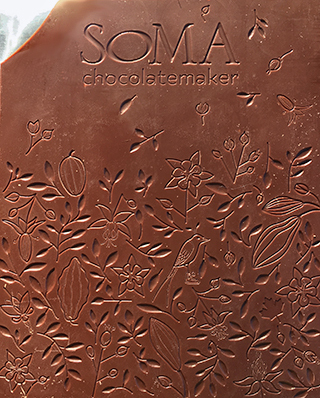 SOMA Chocolatemaker from Toronto has an award-winning 70% Porcelana bar. Like the L’Amourette bar, it’s super hard, but unfortunately it’s also a lot thinner than the L’Amourette, which translates into a brittle bar. Instead of just being hard to break, when you finally do break it, it shatters. This is disappointing on several levels: mouthfeel is lacking, messy chocolate crumbs everywhere, losing expensive chocolate bits to the wind, and the bar doesn’t travel well. It comes sealed in a silvery pouch, which looks cool and must preserve the bar’s flavor and freshness, but doesn’t do much to protect the bar from breakage. As seen in the photo, we lost a corner that had broken off when we opened the package. This is the first SOMA bar I’ve tried, so I don’t know if the mold is unique, but I thought it was pretty. Our group liked the mold, especially its visual cacao references. This could be a nice splurge-y gift for a chocolate aficionado. Comparing the taste to the L’Amourette, we found it not as bitter and fruitier. It had a weird taste at first, but got better towards end, with a subtle caramel taste. Everybody liked it, but nobody loved it. The last bar we tried had the highest cacao percentage. The bar from Scottish chocolate maker, Chocolate Tree, was 85% — and probably the best 85% I’ve ever had. It was actually 2 bars; the brightly colored package contains two sealed aluminum pouches, which I thought was a nice touch. One bar for now, and one for later. High percentages are usually bitter — it’s hard to avoid when there is not much else in the bar to cut the tangy-ness of so much cacao. But we didn’t find this one bitter at all. Instead, this was even fruitier than the SOMA bar, with a strong raisin overtone, plus a nutty flavor throughout. The 85% seemed to translate into a coffee-like intensity, as one of our tasters described it, strong but not bitter. Also surprising for an 85%, was how it got creamy as it melted in our mouths. It does end with a bit of drying astringency, due to the high cacao content, I guess, but I didn’t find it unpleasant. This would make for a nice gift, especially if you know someone who wants to try higher percentages, but is scared they will be too bitter. The package is attractive, the bar is pretty and very fragrant, and the taste is pleasant. After we had tried all 3 bars, we ranked them. Each of us chose our own First, Second and Third place winners. The Chocolate Tree 85% was the clear winner with 3 First Place votes, 2 Second Place votes, and no Third Place votes. L’Amourette’s 75% split the group with 2 First Place votes,1 Second Place, and 2 Third Places. The SOMA 70% was the least appealing to our group, with no First Place votes, 2 Second Places and 3 Third Places. Even though we liked the bars, we question whether it’s worth spending so much more for a bar just because the beans are rare. We found Porcelana chocolate interesting, especially because it has a nutty, versus a fruity, flavor. But we just don’t see ourselves buying this very often because it’s not distinctive enough. 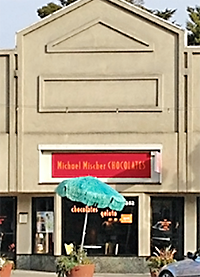 There’s plenty of delicious chocolate out there at half the price. I could see doing another taste testing with Porcelana, but putting it up against other cacao types this time. I would be interested to see how it compares to more typically fruity Venezuelan beans, or the chocolatey-chocolate flavor of Ecuadorian beans. A direct comparison would give a clearer picture of what differentiates a Porcelana bar from the rest. In the meantime, I’m still waiting to try that latest rare chocolate. I don’t think it will be quite as expensive though, seeing as the first commercially available product made with ruby chocolate is a KitKat bar. Date posted: March 10, 2018. This entry was posted in Chocolate around the World, Featured, Front page, Local chocolate, Outside the Bay Area, Review, San Francisco chocolate and tagged 70%, 75%, 85%, Chocolate Covered, criollo, L’Amourette Chocolatier, Porcelana, SOMA Chocolatemaker, Venezuela. Bookmark the permalink.